Okay, is this little fellow cute? Or creepy? Or a little of both, in a manner which we at Scrappyland have come to think of as…screepy? In any event, he’s a made-in-Japan celluloid Scrappy doll, with articulated head and arms, and he’s remarkably fragile. Like Charlie Brown, he has flesh-colored hair, and his tongue-but-no-teeth mouth and slumpy posture make him look like either an overgrown baby or a strangely juvenile old man. 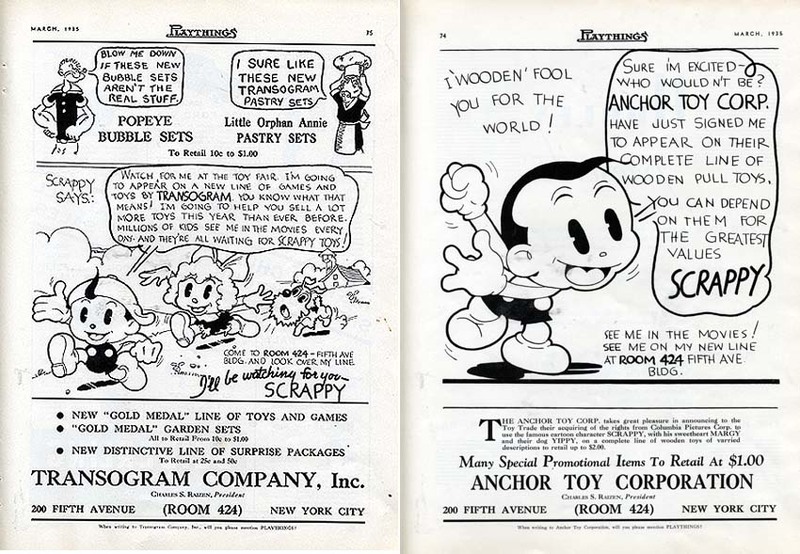 We’re not sure what sort of Scrappy toys and games were produced by Transogram–we wonder if they might have been the ones brandished in photos by Cora Sue Collins–and while we’ve seen Scrappy pull toys at eBay, they’ve evaded our grasp as of this writing. In the Anchor ad, Scrappy invites toy buyers to “see me on my new line at room 424 Fifth Ave. Bldg.”–boy, how we wish we could take him up on his offer. Weirdly, the ad on the back of one of these pages is for the Hubley Manufacturing Corporation–a toy company founded by one John Hubley. Whether he was kin to the John Hubley who was the leading light of UPA–the studio whose films Columbia released years after Charles Mintz’s death–we don’t know. Click on the ads below to see a larger version.